special versions of the Kyman mobile computer as well. The new Falcon X3 mobile computer delivers the ultimate in ruggedness, ergonomics, computing and data capture technologies and a perfect replacement for the Kyman. The Falcon X3 mobile computer options provide a tailored solution for demanding environments needing real-time transaction visibility. Pistol grip and handheld form factors, numeric and alphanumeric keyboards, Microsoft Windows operating systems, a high performance laser, an auto ranging laser and an advanced 2D imager tailor the Falcon X3 mobile computer to the application. Datalogic’s patented ‘Green Spot’ for good-read feedback improves usability by projecting a green spot directly on the bar code read. The Falcon X3 mobile computer also offers a camera to verify promotional displays and document damaged or returned goods. The Falcon’s Laird (Summit) Wi-Fi 802.11 a/b/g radio uses a unique diversity antenna system for maximum coverage. The CCX v4 certification provides encryption levels for PCI compliance and seamless roaming. Datalogic’s software tools and strategic software alliances fit the Falcon X3 mobile computer to the business practice. 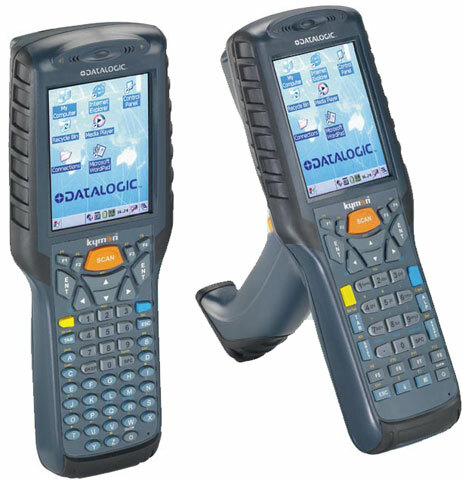 Datalogic’s Desktop and Configuration utilities offer full control over the device experience. Every Falcon X3 mobile computer comes loaded with Wavelink Avalanch and Terminal Emulation, making rapid deployment and central management easy. Finally, Datalogic’s comprehensive service programs protect the Falcon investment. To find the best fit replacement for your Kyman mobile computers, contact us at BarcodesInc.